I first started considering myself an artist in high school. I always liked making things, but it wasn’t until I had a group of people around me who took what they did seriously that I started making art. There was a real distinction in my head that learning to draw and paint was different than putting it to use and saying something visually. There was a perfect combination of teachers at my school: one who focused on the elements of art (whom instilled in all of us the beauty and rigor of drawing and painting), the other inspired us to use our technical skills to find our voices. There was conversation that happened in the art room that was different; it was full of freedom and seriousness, humor and criticism, religion, politics, and things that were important to us, above all it was a place where we all seemed to belong. After high school, I decided to go to art school in Cleveland, Ohio. I spent two years in a foundations program before transferring to the Maryland Institute College of Art. While in school, I had the pleasure to work with Barbara Stanczak and Timothy App; their work was not only inspiring but also taught me how to ask better questions and hold my work to a high visual standard. After receiving my BFA, I earned a Masters of Art in Teaching as well as a Masters of Fine Art. My work is inspired by my surroundings and things close to my heart. I walk and hike a lot. Sometimes with my family and dog, and sometimes just with the dog. The woods provide a place where conversations and feelings seem to flow with ease. I find my most exciting ideas and thoughts come from these conversations and working directly with materials. I had a mentor that would remind me that the only way to make art is to work. The major role that light plays within your work almost makes me wish it was listed on the media used to create the piece. Was your connection with nature any kind of muse in the creation of these pieces? Nature is definitely part of my work. Shifting light is something that has always intrigued me. If I had the time I would definitely watch as many sunrises and sunsets as I could. It doesn’t get more spiritual that that. The Foundry Art Centre got on my radar when I saw the prospectus for Concerning the Spiritual. The title of the show and the jurors’ comments really struck a cord with me. There seemed to be a natural connection between what they were looking for and what I am concerned with in terms of producing artwork. I live in Ellicott City, Maryland so it's rare that I apply to a show where I don’t have control over installing the work (because of its relationship to the space, lighting, and general environment) but this was an opportunity to be part of a bigger dialogue that I’m truly interested in. Please explain your thoughts behind Untitled (Corner Composition Graphite). 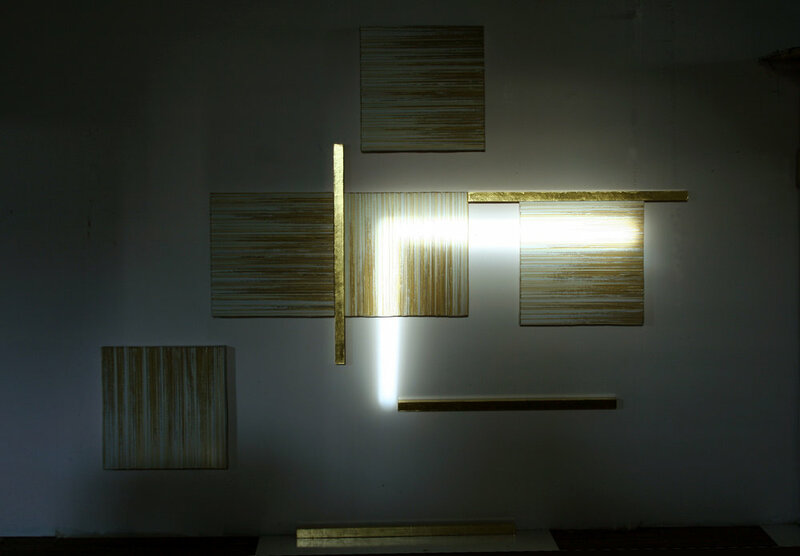 What is the importance of the reflective gold and why does it differ from the white & gold palette used in the other two pieces in the series? I started applying graphite the same way in which I gild. I use traditional gilding techniques, starting with gesso made from rabbit skin glue and marble dust, followed by a mixture of bole and rabbit skin glue. After applying the gold or graphite I burnish it with a stone until it starts to shine. The graphite relates to the gold in a similar fashion in both its appearance and finish - and they are both a metal. Historically, gold was used to create light where it didn’t exist and the blackness of the graphite is a stark contrast to this visually, and yet they both are reflective and create a mirrored surface. Conceptually, I was thinking about a Claude Glass when making this piece. A Claude Glass, as defined by Wikipedia, is a small mirror, slightly convex in shape, with its surface tinted a dark color. Bound up like a pocket-book or in a carrying case, Claude glasses were used by artists, travelers and connoisseurs of landscape and landscape painting. Claude glasses have the effect of abstracting the subject reflected in them from its surroundings, reducing and simplifying the color and tonal range of the scenery to give it a painterly quality. I like that objects help us see things differently and challenge our preexisting ideas and thoughts. The importance of the reflective gold is the power it holds within history and how it has been used symbolically throughout religions and monetary systems. It is seen as decorative, I think the two uses are for different purposes. With the white and gold in the painting, the reflection is contained and held together by the paint, whereas when the gold is on an object it is freed from the canvas and explores actual space instead of pictorial space. I’m working on a small grouping of still lifes from observation. I’m thinking a lot about what it means to be a “man” in this day in age. And although it is a far departure from the work being exhibited at the Foundry Art Centre, I think it is good to question all aspects of ourselves. The series of work in Concerning the Spiritual focuses on our spiritual connection to the world versus my current series which questions our outward roles in society. The most direct way in which I connect with people through my work is through teaching. I currently teach high school art in Howard County, Maryland, as well as at the National Gallery of Art in Washington D.C. Making art definitely enhances my skills as a facilitator for thoughts. Experimenting with materials is also an extremely important part of the creative process for me. Beyond that, I think within the work itself there are material connections with people. I get a lot of questions about why I use gold, or how I make my paintings. The materials I use have a deeper story and history with people, and I think it is good to remind viewers of that and revisit them in a contemporary mindset. View Jeff Hensley's award-winning artwork in Concerning The Spiritual through Friday, January 6, 2017. More of the artist's work can be seen on his website, www.jeffhensley.com.